Fighters who attacked the Syrian border town of Tal Abyad last week were mostly hired from refugee camps, as Mehmet Yuksel, a representative of the Kurdish Peoples' Democratic Party to the United States, told Sputnik. 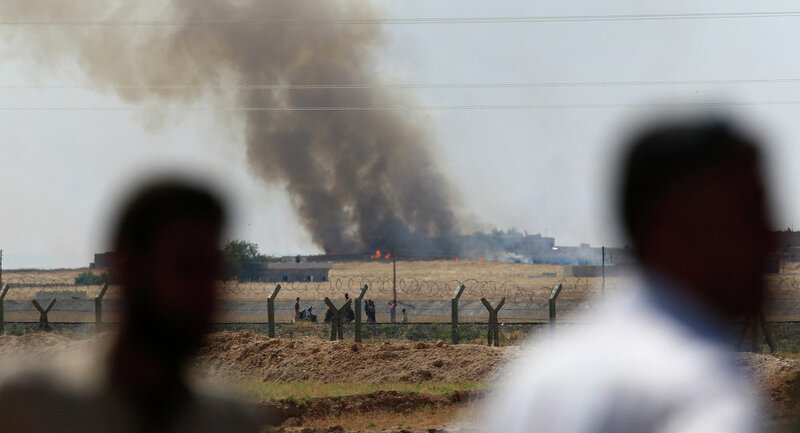 WASHINGTON (Sputnik) — Ankara has most likely hired fighters, who attacked the Syrian border town of Tal Abyad last week, from refugee camps, Mehmet Yuksel, a representative of the Kurdish Peoples' Democratic Party to the United States, told Sputnik. Several breaches of the ceasefire in Syria have been reported straight after it came into force on February 27. On February 28, Lt. Gen. Sergei Kuralenko, the head of Russia’s reconciliation monitoring center in Latakia, said that an assault on Tal Abyad involving up to 100 armed militants with heavy artillery support from Turkish territory was among nine registered ceasefire breaches. "Turkey claimed that the fighters came from some village. But there is no village there, there is only a Turkish military base, checkpoints. Turkey was also claiming they came from the south – in this case, they would have to make 40 kilometers to reach that part to attack from the Turkish side… We received information that most probably Turkey got these people from refugee camps, giving them weapons and making them attack," Yuksel said. He added that neither any Kurdish, nor any opposition party has ever been allowed to visit any of the refugee camps in Turkey, despite numerous requests. "It means something else is going on in those refugee camps… Not only the Kurds, but also the Turks, opposition parties couldn’t visit the camps," Yuksel said.